HOUSTON (KTRK) -- Another accident involving an overturned truck has traffic jammed along the Katy Freeway. This time, it's at Eldridge northbound at the Katy Freeway overpass feeder road. Our Eyewitness News crew reports a dump truck overturned, losing its load along Eldridge. We are not yet certain what the truck was carrying, but know a Hazmat unit has been called to the scene. The driver's condition is unknown. Houston firefighters are there blocking off the roadway. An additional call has been made for backup to HPD. 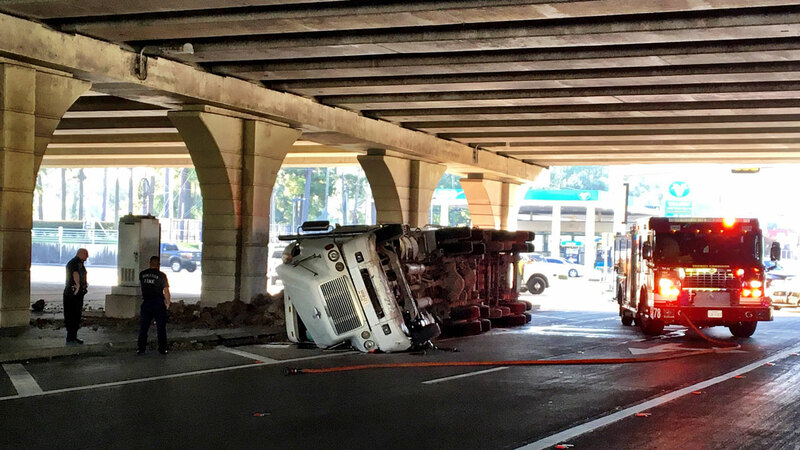 Earlier this morning, a big rig carrying granite flipped on the West Loop at the exit ramp for the Katy Freeway's westbound lanes. The wreck shut down the freeway for hours as crews worked to clear the smashed granite off the road. Fortunately, the driver was okay.